At Casey Research, we pride ourselves on being focused on facts. Which is far easier said than done. That's because, even when dealing with scrupulously honest mining company executives, they naturally want to present themselves in a positive light and so skew almost entirely toward the sunny side of the street. And given that a significant percentage of the people working in the junior resource sector are the polar opposite of "scrupulously honest," assuming that anything you hear qualifies as a fact is a poor starting point. Yet, getting to the facts on the many resource companies that come our way each week is crucial. Without the facts, any conclusions on whether or not a company warrants our investment dollars, or is worth bringing to the attention of our subscribers, could well be built on nothing more than a promoter's dream. A case in point. Rather than rely on the mainstream press or various mining periodicals, Louis James, senior researcher for our monthly International Speculator newsletter, recently decided to dig in deep on the question of whether or not Gabriel Resources would be able to cut its way through the political tangle that has kept its Rosia Montana deposit in Romania on ice for years. This is no idle line of inquiry; Rosia Montana is one of the world's few remaining undeveloped giant gold deposits. If Gabriel succeeds in wading through the political opposition, it will unlock tremendous profits for early shareholders. As you'll read in this report below, in order to get to the facts, we had to go to great lengths, including hiring an undercover investigator to literally go door to door in Rosia Montana, site of the mine. Gabriel Resources - Time to Buy? For some time now we have been following Gabriel Resources (T.GBU), a company there is much to like about. For starters, there is the sheer size of the company's Rosia Montana mega-deposit in Romania (more on that in a moment). Then there is the fact that Gabriel has a new and very determined management team that is taking a hands-on approach to shepherding the deposit toward production. Every ounce of that determination will be needed; if you believe everything you read, the community of environmental activists would rank Rosia Montana as one of the most hated mineral development projects in the world. There are web sites dedicated to blocking the project (www.nodirtygold.com) and even celebrities speaking out against the development. Being speculators, and recognizing the potential size of the prize if the broader investment community was to change its view on the prospects of Rosia Montana coming into production, we decided to see for ourselves what was actually happening on the ground in Romania. 10.1 million ounces of gold in Proven & Probable reserves, plus another 14.6 million ounces in Measured & Indicated resources, and another 1.2 million Inferred ounces. 47.6 million ounces of silver in Proven & Probable reserves, plus 64.9 million ounces in Measured & Indicated resources, and another 3 million Inferred ounces. Projected production of 635,000 ounces per year during the first 5 years, at a total cash cost of US$181 per ounce, for an IRR of 18%. So it's not the geology but the politics of trying to build a mine in the face of environmental opposition that has GBU selling for about $30/oz of gold in the ground, versus a more typical $100/oz for the kind of resources it is known to possess. Make no mistake; large, well-defined gold deposits like Rosia Montana are extremely rare and exactly the sort of thing resource-hungry major mining companies are likely to buy at a substantial premium. All of which, under normal circumstances, would make Rosia Montana equally attractive to institutional investors looking for the next big play. But they're not going to risk their capital as long as Rosia Montana looks too politically hot to touch. Should their perception change, and they come to believe that the political risk has been resolved-say, when Gabriel gets its mining permit-expect the herd of institutional investors to pile in, sending the GBU shares to the moon. It's our intention as speculators to beat them to the door. Which brings us back to a realistic assessment of Gabriel's political prospects. Is the political risk in Gabriel beginning to subside? That's what we determined to investigate. But none of us, not even Doug, speaks Romanian, and it would defeat our purpose to simply go on a guided tour offered by the company, with a company translator posing all our questions for us. Fortunately, thanks to our international network of contacts, we were able to find a native Romanian-speaking researcher willing to help us with the investigation. First, our researcher attended public hearings in Bucharest, at which Gabriel's representatives gave presentations on environmental, safety and other issues-a particularly thorny one being that the company wants to move the town of Rosia Montana itself. The environmentalists in opposition had salted the audience with a dozen young people in dressed in green T-shirts who disrupted the meeting whenever the company people said anything they disagreed with-or didn't want people to hear. But it was much ado about nothing: our researcher observed that of the nearly 200 people present, almost all had some professional interest in the matter. They weren't really there to learn, but to witness, or to try to influence. Net result: no one left more in favor or more in opposition to the project than when they arrived. Next, our researcher went to the town of Rosia Montana to assess the situation first-hand. For the third year now, anti-mining groups with global networks (and financial support) hosted a festival near the picturesque town, in theory to save the earth and the poor subsistence farmers of Rosia Montana from being kicked out of their cottages by the evil mining company. The festival features live music, which does indeed draw a lot of people-but our researcher found that these young people (he estimated most were still teenagers) were more interested in smoking and listening to the music than eco-politics. What about the poor subsistence farmers? Rosia Montana is a mining town. The last two mines in the area were shut down earlier this year by the government, because they were state-supported work projects that were trashing the environment. Romania has to clean up that sort of thing in order to join the EU, which it is working very hard to do. There is no significant employment in the area (a neighboring town had a factory once, but it was shut down 16 years ago), and the severance pay the ex-miners in the area are getting runs out at the end of December. The environmentalists have suggested that the local community survive by weaving baskets and carving wood to sell to tourists, which seems to us to be somewhat disconnected from reality. These people are desperate and they want to see the Rosia Montana deposit creating jobs again-but this time with modern mining technology that won't be so damaging to the environment. And that is exactly what Gabriel proposes to do (the deposit area is currently a toxic disaster, due to the employment of primitive mining techniques over the last 2,000 years, particularly during the Soviet years). So, it's no surprise that our researcher found that about 80% of the locals are only too happy to sell their houses, either to move on to greener pastures elsewhere, or to move into the new town the company is building and take jobs with the company. His findings are supported by the fact that the mayor of Rosia Montana was elected on a pro-mine platform. And the hold-outs? Gabriel says they can stay and the company will work around them (no little old ladies need be dragged from their cottages on TV). Our researcher's sense of the politics of the project on the national scale was that the national government is in favor of the project-Romania's president has gone on record in the press saying that the project will be developed-but that much of the intellectual community is reflexively opposed, though few have apparently been to Rosia Montana or taken the time to understand the local economy. In short, politics has held the share price of this company down for years, but the political tide appears to be shifting. There is opposition, but that opposition is out of touch with the needs of the local community-and even of the environment, because the Romanian government doesn't have the money to clean up Rosia Montana, something Gabriel has committed to helping with. Of course, trouble-makers could still derail progress at Rosia Montana, so there is still risk in the play, but for once, the needs of the locals, the environment, and a responsible mining company are lining up. We believe Gabriel will get its Environmental Impact Assessment (the largest and arguably most important component of its mining permit) approved by the Romanian government later this year. If they do, mine construction, new jobs, environmental clean-up, etc. could all start rolling early next year. From there, it's off to the races for GBU shares, which will then represent ownership of what is truly a mountain of gold. 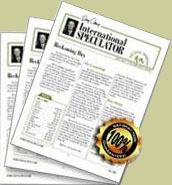 It's a speculation, to be sure-but that's what we do at Casey Research, and we'll be following this story for our subscribers in the pages of the International Speculator.